This article is about the novel. For other uses, see Jane Eyre (disambiguation). 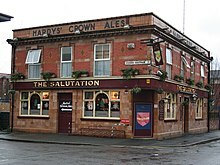 The Salutation pub in Hulme, Manchester, where Brontë began to write Jane Eyre; the pub was a lodge in the 1840s. 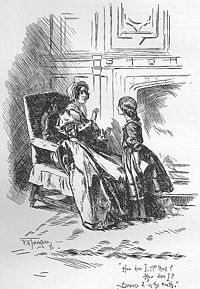 The early sequences, in which Jane is sent to Lowood, a harsh boarding school, are derived from the author's own experiences. Helen Burns's death from tuberculosis (referred to as consumption) recalls the deaths of Charlotte Brontë's sisters, Elizabeth and Maria, who died of the disease in childhood as a result of the conditions at their school, the Clergy Daughters School at Cowan Bridge, near Tunstall, Lancashire. Mr. Brocklehurst is based on Rev. William Carus Wilson (1791–1859), the Evangelical minister who ran the school. Additionally, John Reed's decline into alcoholism and dissolution recalls the life of Charlotte's brother Branwell, who became an opium and alcohol addict in the years preceding his death. Finally, like Jane, Charlotte became a governess. These facts were revealed to the public in The Life of Charlotte Brontë (1857) by Charlotte's friend and fellow novelist Elizabeth Gaskell. The Gothic manor of Thornfield Hall was probably inspired by North Lees Hall, near Hathersage in the Peak District. This was visited by Charlotte Brontë and her friend Ellen Nussey in the summer of 1845, and is described by the latter in a letter dated 22 July 1845. It was the residence of the Eyre family, and its first owner, Agnes Ashurst, was reputedly confined as a lunatic in a padded second floor room. It has been suggested that the Wycoller Hall in Lancashire, close to Haworth, provided the setting for Ferndean Manor to which Mr. Rochester retreats after the fire at Thornfield: there are similarities between the owner of Ferndean, Mr. Rochester's father, and Henry Cunliffe who inherited Wycoller in the 1770s and lived there until his death in 1818; one of Cunliffe's relatives was named Elizabeth Eyre (née Cunliffe). 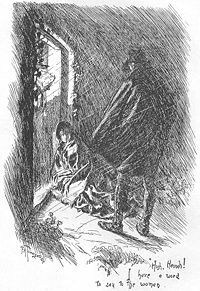 The sequence in which Mr. Rochester's wife sets fire to the bed curtains was prepared in an August 1830 homemade publication of Brontë's The Young Men's Magazine, Number 2. Charlotte Brontë began composing Jane Eyre in Manchester, and she likely envisioned Manchester Cathedral churchyard as the burial place for Jane's parents and the birthplace of Jane herself. The novel has been adapted into a number of other forms, including theatre, film, television - and at least two full-length operas, by John Joubert (1987–97) and Michael Berkeley (2000). The novel has also been the subject of a number of significant rewritings and reinterpretations, notably Jean Rhys's seminal 1966 novel Wide Sargasso Sea. In November 2016, a manga adaptation, published by Manga Classics Inc., was adopted by Crystal S. Chan, with artwork by Sunneko Lee. Jane Eyre's initial reception contrasts starkly to its reputation today. 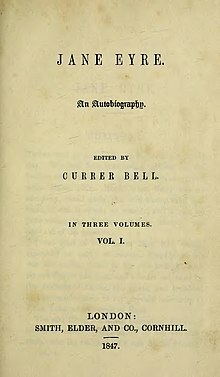 In 1848, Elizabeth Rigby (later Elizabeth Eastlake), reviewing Jane Eyre in The Quarterly Review, found it "pre-eminently an anti-Christian composition," declaring: "We do not hesitate to say that the tone of mind and thought which has overthrown authority and violated every code human and divine abroad, and fostered Chartism and rebellion at home, is the same which has also written Jane Eyre." Literary critic Jerome Beaty felt that the close first person perspective leaves the reader "too uncritically accepting of her worldview", and often leads reading and conversation about the novel towards supporting Jane, regardless of how irregular her ideas or perspectives are. In 2003, the novel was ranked number 10 in the BBC's survey The Big Read. ^ The exact time setting of the novel is impossible to determine, as several references in the text are contradictory. For example, Marmion (pub. 1808) is referred to in Chapter 32 as a "new publication", but Adèle mentions crossing the Channel by steamship, impossible before 1816. ^ "The HarperCollins Timeline". HarperCollins Publishers. Retrieved 18 October 2018. ^ Lollar, Cortney. "Jane Eyre: A Bildungsroman". The Victorian Web. Retrieved 22 January 2019. ^ Burt, Daniel S. (2008). The Literature 100: A Ranking of the Most Influential Novelists, Playwrights, and Poets of All Time. Infobase Publishing. ISBN 9781438127064. ^ Martin, Robert B. (1966). Charlotte Brontë's Novels: The Accents of Persuasion. New York: Norton. ^ Wood, Madeleine. "Jane Eyre in the red-room: Madeleine Wood explores the consequences of Jane's childhood trauma". Retrieved 7 December 2018. ^ Brontë, Charlotte (16 October 1847). Jane Eyre. London, England: Smith, Elder & Co. p. 105. ^ Brontë, Charlotte (2008). Jane Eyre. Radford, Virginia: Wilder Publications. ISBN 160459411X. ^ Gaskell, Elizabeth (1857). The Life of Charlotte Brontë. 1. Smith, Elder & Co. p. 73. ^ Gilbert I, Gubar II. Madwoman in the Attic after Thirty Years. ^ "Jane Eyre: a Mancunian?". BBC. 10 October 2006. Retrieved 24 April 2013. ^ "Salutation pub in Hulme thrown a lifeline as historic building is bought by MMU". Manchester Evening News. 2 September 2011. Retrieved 6 September 2011. ^ a b Stevie Davies, Introduction and Notes to Jane Eyre. Penguin Classics ed., 2006. ^ "Wycoller Sheet 3: Ferndean Manor and the Brontë Connection" (PDF). Lancashire Countryside Service Environmental Directorale. 2012. Archived from the original (pdf) on 14 June 2013. Retrieved 24 March 2012. ^ "Paris museum wins Brontë bidding war". BBC News. 15 December 2011. Retrieved 16 December 2011. ^ a b Shapiro, Arnold (Autumn 1968). "In Defense of Jane Eyre". SEL: Studies in English Literature 1500–1900. 8 (4): 683. JSTOR 449473. ^ Beaty, Jerome. "St. John's Way and the Wayward Reader" in Brontë, Charlotte (2001) . Richard J. Dunn (ed.). Jane Eyre (Norton Critical Edition, Third ed.). W.W. Norton & Company. pp. 491–502. ISBN 0393975428. ^ "The Big Read". BBC. April 2003. Retrieved 21 December 2013.